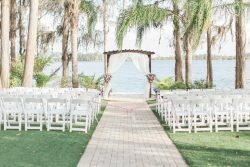 From wedding receptions and ceremonies to corporate events and much more, your celebration will have a spectacular feel when you celebrate at Paradise Cove in Orlando, Florida. White, sandy beaches, flowing palms, and so much more create an unforgettable atmosphere while Lake Bryan creates a spectacular backdrop to be admired from all angles. Tiki torches and string lights throughout the venue add to the ambiance while your guests take in all that your celebration has to offer and Paradise Cove can also feature a wide array of amenities, including after-dark boat rides, fire dancers, crab racing and much more. There are even palm-thatched cabanas and a full bridal suite available for use with any wedding, plus every guest will be happy to enjoy a drink from the venue’s tiki bar while relaxing on one of their rainbow-hued cabanas. An extraordinary wedding, corporate event, or celebration of any kind can be found at Paradise Cove in Orlando, Florida. Call (407) 239-6939 or visit paradisecoveorlando.com to learn more. Booking Howl2GO Dueling Pianos’ world class show to your Orlando,FL event couldn’t be simpler. From conventions to corporate events, weddings to fundraisers, our unbeatable Dueling Piano shows bring a high energy, interactive show that your guests will remember for years to come anywhere in Florida!